Laminar flow changes to turbulent flow when it encounters an obstruction. Laminar flow flow occurs when fluid flows in parallel layers with no internal motion in the flow. Superconducting current is fundamentally similar to laminar flow. In a perfect conductor, electrons do not undergo collisions, and flow without hindrance. Superconductors have very little resistance to flow. A superconductor expels a magnetic field, effectively causing it to reflect back toward its source. This causes phenomena like the levitation of a magnet. Electrons do encounter hindrance to their motion through most materials. We characterize this hindrance to motion in a property called resistivity. Resistivity for various metals is shown in the table above. Note that copper has relatively low resistivity, which makes it useful for constructing electric circuits. Tungsten has relatively high resistivity, which makes it useful for filaments used in light bulbs. Resistivity is an intensive property, it depends on the material but not the amount or dimensions of the material. It is useful to define the amount of resistivity inherent to a given object or circuit element. Resistance R is defined as the resistivity ρ times the length over the cross-sectional area of a conductor. The units of resistance are called ohms (Ω) and are equal to volts per amp. The relationship between potential and current is shown in the graph above. Increasing potential causes the current to increase. The relationship V = IR is known as Ohm's law, and is very useful in circuit analysis. If the slope is constant as the voltage is varied, the circuit element has constant resistance, and is known as an Ohmic device. Common circuit elements called resistors are Ohmic devices. The symbol for a resistor is a set of zigzag lines. Light bulbs are not Ohmic devices, as the current through a light bulb does not vary proportionally with voltage. A battery chemically separates charge by the usage of two different metals. In short, charge is attracted from one kind of metal toward another kind of metal. The battery does work to separate the charges and stores the work done as potential energy. The potential difference in the battery causes an electric field to be set up in a connecting wire. When the terminals of a battery are connected via a conducting wire, the electrons are free to flow away from the negative terminal (which has an excess of electrons) toward the positive terminal (which has a deficit of electrons). The potential difference of the battery causes charges to flow around a complete circuit. When the electrons flow around a complete current loop, they lose all of the potential they had gained from the battery. The energy is used by the components of the circuit, such as a glowing filament. 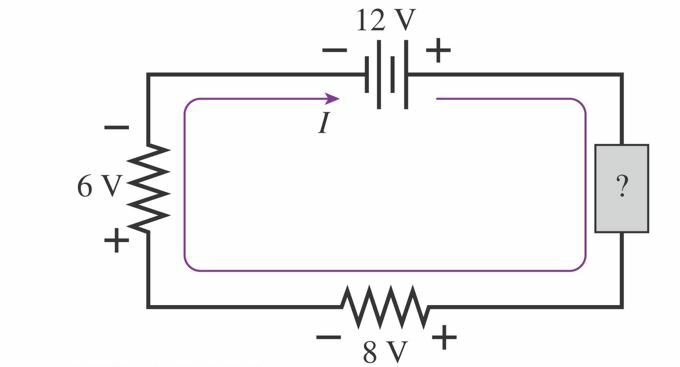 What is the potential difference across the unknown circuit element?